This would be a simple case that would be mounted to either the back or bottom of any commercial gaming chair This would make the gaming chair a true all in one solution. For example the BoomChair VX2 Gaming Chair seen here is only $79.99 U.S. It has a large and strong enough bottom and back to allow easy mounting either inside or on the back. The Board would be mounted center back with the hard drive and blu-ray on each side. I believe the power supply could be mounted in the same area as the current one. the speakers could be left or removed and replaced by led fans. Any Gaming chair would work for this or the modders could make their own. materials should be cheap. mostly MDF Fabric and padding or an actual car seat could be used. 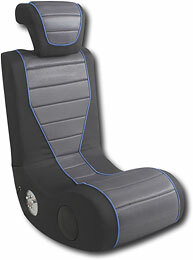 One maybe able to find a usable racing seat at a junk yard for a lot less that a new one. Also one can find the legs and wheels of a good 2nd hand chair and attach it to the bottom. well I think a long Hdmi cable could easily attach to the back of a monitor or tv a long with the optical out.